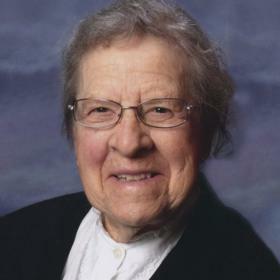 Joan was born Johanna Vogel on October 12, 1923 in Grand Rapids Michigan. She was raised near Fremont, Michigan where she attended Roottown School. After finishing school, she first cleaned houses, then worked in Grand Rapids packing cookies and crackers at the Hekman Biscuit Company (later Keebler Company). Later, after being trained on the comptometer, she worked in the office at McInerney Spring &Wire Co., one of Grand Rapids largest employers and one of the first to hire women during and after World War II. Before she married, Joan traveled to New York City and Washington DC with her sister, Edith. On June 12, 1952 Joan was married to John Kamp. They moved to a farm in Jenison where they spent the next 62 years. They were blessed with 8 children. Joan's life was centered around her home, family and church. For many years Joan's days were devoted to raising and providing for her family. For 22 years she helped with the family chicken and egg business. She also helped in the large garden (raspberries were her favorite) and she worked constantly; canning, sewing, cooking and baking; she loved trying new recipes she clipped from the newspaper. Despite the demands of raising a large family, Joan found time to relax and enjoy family and friends, often with picnics in local parks, or taking the family for an evening swim. Saturday in the Kamp household was busy with baking, cleaning, and household chores: the day was full of hard work and laughter. Sundays were quieter, the family attended church services and spent time reading and psalter singing. Joan was a member of the First Netherlands Reformed Congregation. Joan loved the changing colors of the fall leaves, and up until the past few years, she and her family enjoyed an annual fall picnic at High Rollaway Park in Newaygo. After her children were grown, she cared for grandchildren, took long daily walks, and worked in the garden, canning and selling vegetables to neighbors. 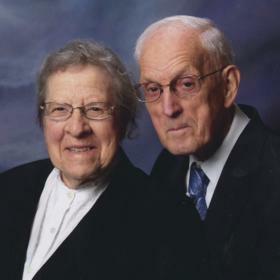 In 2014 John and Joan moved to Oakcrest (American House)assisted living in Jenison. They spent the next 3 years there until they were both hospitalized in October of 2017. Joan Kamp, age 94 of Jenison, passed away January 14, 2018 after a lengthy hospitalization. She was preceded in death by her husband, John in November of 2017; her brother Andrew (Angie) Vogel; sister, Dena Breuker; and brothers-in-law Gordon Deur and Bill Noorduyn. Joan is survived by her children Kay & Paul McSherry, John Kamp, Joyce Bono, Ruth & John Gibson, Thomas & Helen Kamp, William & Paige Kamp, Marilyn Kamp, Deborah & Mike Kiekover; many grandchildren great grandchildren; sisters Ruth Noorduyn, Edith (George) VanStrien; brother, William Vogel; brother-in-law Daniel (Laura) Breuker; as well as many other brothers-in-law, sisters-in-law, nieces and nephews.